Deliver a Message to Gov. Cuomo Jan. 3rd. & new affordable housing statewide. Happy New Year to all. Here's to tenant victories in 2018. Governor Andrew Cuomo is invited! It is urgent that ALL NEW YORKERS unite to maintain affordable housing statewide! Steve Wishnia's article in the Village Voice: Saving Mitchell-Lama, notes that Mayor de Blasio's plans to save ML will help keep Mitchell-Lama co-ops affordable, but don't do much for the renters. End Vacancy Bonus and Preferential Rent Loopholes! vacancy bonus and preferential rent loopholes. lease renewal leading to a sudden increase of hundreds of dollars. protection bills that stop rents from spiraling out of control. 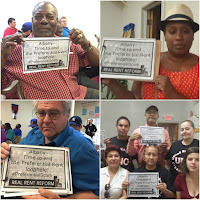 We need Real Rent Stability. City Limits: Is "Housing Not Warehousing" next? The article is VERY LONG with great statistics, so this is just an excerpt. ProPublica, April 25, 2017, 8 a.m.
NYC Enacts Right to Counsel in Housing Court! Tenants have won a huge victory: Lawyers will provided free for tenants whose household income is under $50,000 (for a family of 4), and those with more income will get free legal counseling (but not representation) in court. Watch Ryan Harvey, Ani DiFranco, and Tom Morello singing Woody Guthrie's "Beach Haven Ain't My Home," about the Fred Trump-owned, segregated development where Woody was living at the time. Music by Ryan Harvey. . Click on "read more" for the lyrics by Woody Guthrie. [E]ven if we can hope for progress on a local level, New Yorkers can’t afford to ignore housing problems outside city borders, says Laura Mascuch, director of the Supportive Housing Network of New York. Rural counties—including areas of upstate New York—depend on federal sources for a greater portion of their housing budgets, and their housing problems affect city residents, too: Nationally, homeownership rates are at their lowest in fifty years, which experts say is helping to drive up demand in the rental market, worsening the affordability crisis in cities. One election result analysis shows a correlation between negative home values and support for Trump. In other words, hiding in a progressive bubble while ignoring federal fights is probably not the answer, either.